US, 2009, 104 minutes, Colour. 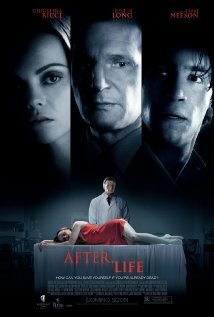 Liam Neeson, Christina Ricci, Justin Long, Josh Charles, Celia Weston, Chandler Canterbury. Directed by Agnieszka Wojtowicsz- Vosloo. After.life seems unusual vehicle for Liam Neeson. He plays the manager of a funeral parlour and has a special gift of being able to talk with and communicate with the dead. While the film is presented with a great deal of realism, audiences will be wondering whether this is real, fantasy, in the imagination of the director of the parlour, in the imagination of the dead woman. The film was not clear in where it stands on the nature of the afterlife, the experience of death, purgatory real experiences – and leave this to the puzzling out of the audience. Liam Neeson is his reserved self, quiet, good-mannered, yet intense in his conversations with the dead young woman. She is played by Christina Ricci, who has some moments in real life, in her teaching, at a restaurant and the proposal by Paul (Justin Long). However she is involved in a car crash and dies only to find herself lying on the slab in the funeral parlour, awake, puzzled, trying to deal with the manager and his discussions with her. He even offers her the opportunity to go and make something of a life, but she hesitates and does not go out. There is also a little boy from school who seems to have a similar kind of gift of communicating with the dead. Perhaps the film promises more than it offers, not giving any explanation of the nature of this life after death, using some conventions of horror movies – but not in any major heightened or sensationalised way. 1. The title, the significance of the dot? Expectations? 2. A small American town, the burial parlour, the school, restaurants? Atmosphere of realism? The musical score? 3. The blend of horror elements, philosophy, moralising? 4. The introduction to Elliot Deacon and his work? At the funeral parlour? Alone? 5. Anna’s story, as a teacher, her work in the classroom, friendship with Jack? Relationship with Paul, love, her fears, at the restaurant, his proposal and her leaving, upset? Her attending the funeral of her teacher, with his wife, her knowledge of the funeral parlour? The crash? 6. Anna as dead, at the parlour, her red dress, the wound on her head, waking, finding herself in the death situation? The discussions with Elliot? Her attempted escape, the locked door, her anger and smashing his room, getting out into the corridors, hiding, phoning Paul? The visit of her mother, of Paul, wanting to know whether they wept? At the window and Jack seeing her? The black dress for her funeral? Elliot and the injections, the policeman visiting his brother and wanting to look at her? The viewing, Paul and his kiss, the burial, the wake, her seemingly buried alive and scratching at the top of the coffin? 7. The blend of realism and fantasy? Was Anna really dead? Dreaming? Purgatory story? The story of the experience of death and the transition to the afterlife? 8. Elliot, his work, manner, his gift, seeing Anna at the first funeral, his talk with her, his character, his courtesy to visitors, the policeman and his prurience and ousting him? Jack and his sharing with him? at the parlour, at the grave? Meeting Paul, urging him away, Anna’s mother? 9. The discussions between Anna and Elliot, her experience, non-belief, growing desperation, Elliot offering her the chance to go out, her standing at the door and not taking it? Elliot and the seemingly normal discussions, about her life, his talking to the other dead people, his reaction to Anna and commenting that that was what everyone said, offering opportunities for life? Saying people were not dead but that there was no life in them? His reaction to her hiding, the phone call, his anger at the mess she made? 10. The old lady, the make up, appearing to Anna? 12. Paul, his character, busy with his job, love for Anna, the meal, his being upset, her death, trying to see her at the funeral parlour, his garish nightmare? Going to the police, discussions with Tom, the policeman whose brother had died, his desperation, the kiss at the funeral? His grief? His talking with Jack, his attacking him, the police reaction? 13. Anna’s mother, haughty, self-contained, visiting the body, grief the funeral? 14. The police, Paul and Tom, their friendship, Tom unable to do anything? 15. What was the film discussing about the nature of death, the meaning of life, life after death, an interim period to be ready for the afterlife? People with special gifts, conversing with the dead?